• Most Volatile Week Since February. U.S. stocks slumped last week, with the S&P 500 finishing a volatile week just shy of a 10% correction from its September 20 record high as earnings from a pair of mega cap bellwethers in internet search and online retailing disappointed. It was an intense week marked by the largest and biggest price swings since February. The news overshadowed a stronger-than-forecast GDP report showing the strongest back-to-back quarterly growth gains since 2014. • Weekly Performance. For the week, the S&P 500 lost 3.93%, the Dow Industrials fell 2.97%, while the tech-heavy Nasdaq Composite sank 3.78%, its fourth straight weekly decline. Excluding dividends, the Dow Industrials and S&P 500 had both erased their year-to-date gains. • Pleasing GDP Data. The U.S. gross domestic product (GDP) expanded by 3.5% in the third quarter (3Q), topping economists’ growth projections for 3.3%. Moreover, personal consumption also exceeded forecasts (4.0% vs. 3.3%), rising the most since the 4Q 2014. Importantly, a key measure of inflation rose 1.6%, cooling a bit after rising 2.1% in the prior quarter. Meanwhile, the University of Michigan’s final October reading of consumer sentiment fell to 98.6, slightly lower than its preliminary estimate for 99. Despite a monthly decline, consumer sentiment remains near a 14-year high. • Defensive Stocks Perform Best. All 11 major sector groups ended negative last week, with Energy (-7.06%), Industrials (-5.55%) and Financials (-5.23%) down the most. Real Estate (-1.02%), Consumer Staples (-1.36%) and Utilities (-2.13%) were down the least. • Treasurys Rally. Treasurys advanced on Friday and for the week amid a rotation into safer-haven assets, sending the yield on benchmark 10-year Treasury notes down 4.1 basis points on Friday, and off 11.7 basis points during the week ending at 3.076%. The U.S. Dollar Index strengthened by 0.67% last week, ending at 96.359. WTI crude oil futures fell 2.44% during the week, ending at $67.59/bbl. to record a third straight weekly loss. Friday, November 2: Trade Deficit, Non-farm Payrolls, Unemployment Rate, Durable & Factory Orders. The U.S. economy is growing at a strong pace, but one area of the economy that has struggled in recent months is housing. 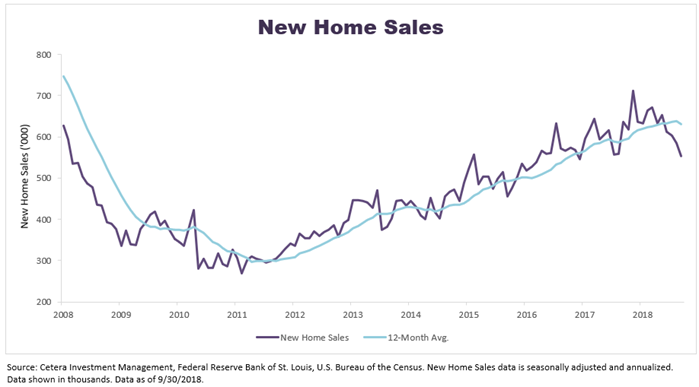 New home sales plummeted to a seasonally adjusted annualized rate of 553,000 in September, the lowest reading since December 2016 and the fourth straight monthly decline. Compared to a year ago, new home sales are down 13.4% and the median selling price fell to $320,000, a decline of 3.5% year-over-year. Furthermore, the monthly supply of new homes available for sale climbed to 7.1 months, the highest since March 2011. There is concern that a shift is occurring in the housing market following several years of gains due in large part to strong demand from an improving economy coupled with limited supply. This year, however, a number of headwinds including elevated home prices in several major metropolitan areas, rising mortgage rates, and a reduction in housing-related tax benefits following the implementation of the Tax Cuts and Jobs Act have slowed housing. All of these headwinds relate to affordability, and therefore we see supply increases as a sign that demand is beginning to wane. We are still supportive of the view that long-term structural tailwinds will benefit housing, but in the near-term, the housing market may experience more weakness until affordability improves in several regions of the country.